EasyJet has come top of the league for airlines trying to cut carbon emissions to tackle climate change. A report suggests that by 2020 its emissions per passenger kilometre will be less than half that of some rivals. The firm's performance is partly down to its modern, efficient fleet and its push to fill every seat. Companies named as having the weakest plans to cut emissions are Air China; China Southern; Korean Air; Singapore Airlines and Turkish Airlines. How dirty is jet travel? The report from the London School of Economics is backed by a group of institutional investors, the Environment Agency Pension Fund. It is anxious for their funds to support firms committed to reducing emissions. The investors also complain that the airlines are trying to achieve their targets using the controversial process of offsetting – where firms plants trees to compensate for their own CO2 emissions. What's the reaction of the airlines? Aviation creates 12% of transport-related emissions. The industry body ICAO (International Civil Aviation Organization) told BBC News it couldn't comment on individual airlines, but said the industry's carbon-cutting plans were "on track". Aviation has been given easier targets than other industrial sectors because although aircraft are becoming more efficient, this trend has been overwhelmed the by the relentless increase in people wanting to fly. Some caveats must be applied to the LSE research. First, it doesn’t take into account that some airlines allow much more baggage than others, which alter the notional weight per passenger and thus their CO2 tally. 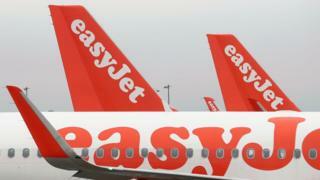 There is also some cause for caution over EasyJet's carbon virtue. Remember that the figures are based on CO2 per passenger kilometre. This means EasyJet can improve its per capita performance by stuffing planes with cut-price ticket-holders, thereby potentially encouraging a new generation of frequent flyers. Korean Air told us the calculation method for the assessment didn't take into account that it and Singapore Airlines tend to carry more freight than average airlines - and this increases their carbon emissions. The firm said it was exceeding the ICAO guideline of improving fuel efficiency by 1.5% per annum.